These are the myths about medical malpractice law that won’t go away. Far too often, people harmed by medical malpractice hear these uninformed statements and vow to suffer in silence, lest they become part of a bigger problem. So, let’s tackle some of the biggest whoppers about medical malpractice claims, and separate fact from fiction. It’s almost accepted lore that there are too many malpractice claims and the vast majority of malpractice lawsuits are frivolous and without merit. But nothing could be further from the truth. First, most people harmed by medical malpractice never file suit. Studies indicate that only about 10% of all medical malpractice ever results in a malpractice claim. Most people don’t run to file a lawsuit after they’ve been injured by health care provider negligence. Second, the vast majority of lawsuits have merit. In one Harvard study, researchers examined 1,400 medical malpractice lawsuits and found that 97% of the claims were merit based. The study noted that “portraits of a malpractice system that is stricken with frivolous litigation are overblown.” Researchers also reported that 80% of medical malpractice cases allege severe injury or death. To prevent a similar incident from happening to another patient. A need for an explanation as to how and why an injury happened. A desire for financial compensation to make up for actual losses, pain, and suffering, or to provide future care for the injured patient. A desire to hold doctors accountable for their actions. We’ve all seen the “ambulance chaser” on TV or read about them in a John Grisham novel, literally hounding patients in their hospital rooms to sign on to a lawsuit for a big payday. But in reality, studies find that attorneys turn down most of the cases that they screen, anywhere between 80 and 97% of potential medical malpractice claims. One of the most popular arguments for limiting damage awards for medical malpractice lawsuits is the claim that these lawsuits have dramatically increased malpractice insurance premiums for physicians, driving them out of business or making the practice of medicine financially untenable. However, the evidence doesn’t support this argument. Rather, malpractice premiums seem to be more closely linked to the fortunes of the insurance industry than to the rate of malpractice lawsuits. In fact, with a few exceptions, medical malpractice insurance premiums have generally decreased over the last 15-20 years. Another popular claim for limiting medical malpractice lawsuits and damage awards is that these suits are somehow to blame for the dramatic increase in health care costs in the United States. The idea is that lawsuits and damage awards cause medical malpractice premiums to increase and physicians pass this cost on to patients in the form of increased fees for services. It’s a nice idea. The problem is that malpractice premiums for physicians have been decreasing over the last two decades, while health care costs have continued to dramatically increase over the same period of time. Clearly malpractice claims aren’t causing medical treatment costs to soar. Blaming malpractice claims for the increase in health care costs also ignores the most direct costs of medical malpractice – the expenses borne by the patients and families harmed by medical negligence. This includes additional medical costs, lost wages, pain and suffering, and sometimes permanent disability or death. The cumulative economic impact of these costs affects our communities as well. Moreover, many studies indicate that malpractice suits actually improve patient care. For example, in the 1980s, anesthesiologists were paying some of the highest malpractice rates in the medical field. Problems with anesthesia were frequent, with an estimated 1 death for every 6,000 administrations of anesthesia. Fed up with large malpractice verdicts, the American Society of Anesthesiologists took matters into their own hands. They revamped procedures, required more training, limited the number of hours an anesthesiologist could work without rest, redesigned equipment, and outfitted equipment with safety devices. Within ten years the mortality rate from anesthesia dropped to 1 in 200,000 administrations of anesthesia, a remarkable improvement. Despite the myths and the criticism, medical malpractice lawsuits are generally only filed in the most egregious of cases, are rarely frivolous, and are more about getting answers or compensations for actual losses than about a big pay out. A malpractice suit can help families receive answers and help mitigate the costs they’ve born because of medical negligence. If you believe you or a loved one have been harmed by medical malpractice, call us today. Our knowledgeable malpractice attorneys can help. 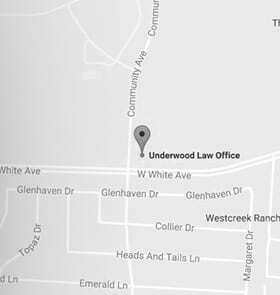 The Underwood Law Office in McKinney, Texas serves all of Dallas and Fort Worth, including McKinney, Frisco, Plano and Allen. The Underwood Law Office in Huntington, WV serves all of West Virginia. For both offices, call our law firm toll-free number 844.UNDERWOOD (844.863.3796) for a free consultation. You may also send us an email. Se habla espanol.